1. 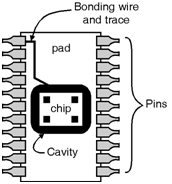 The package pins should have manageable solder connections. 3. The packages should conduct the heat away from the IC to the surroundings. Figure below shows a schematic of a generic package. Here, the circuit board connects pins at the edge of the package. The pads are metal to be sol¬dered to the leads. The cavity is gold-plated to the IC sub¬strate. Packages also has electrical problems which are caused by the inductance of the pins and the printed circuit board attached to them-on-chip wires. Further, package inductance introduce significant voltage fluctuations.